"This is a wonderful opportunity for the Canberra district to showcase our many award-winning reds and whites to Sydneysiders. It will be a great representation of what our growing wine region has to offer." said Annemaree Schafferius, spokesperson for the Canberra District Wine Industry Association. "Ten wineries and winemakers will be onsite over the three days to share their knowledge on winemaking, wine styles and of course show off their own wines with tastings for the Sydney public. "We're sure Sydney will be impressed with the range of styles and depths of flavours achieved by our many talented winemakers busily working away just a short drive from Sydney in the nation's capital," she continued. The Canberra district wineries attending the Good Food and Wine Show are Lerida Estate, Capital Wines, Shaw Vineyard Estate, Lambert Vineyard, Four Winds Vineyard, Mount Majura, Gundog Estate, Yarrh Wines, Dionysus and McKellar Ridge. Capital Wines will also be taking part in a Riesling tasting session at the show's Riedel Wine Theatre at 3.45pm on the Saturday. As is well known, the 2007 vintage was one of the best in the last 20 years for Hunter Valley shiraz, with hot, dry and drought conditions leading to low yields and high quality fruit. Tintilla's winemaker James Lusby jokes, "If you did not make a good wine in 2007 you should not be in the winemaking game." Of course a good vineyard also helps and the red clay soil over limestone conglomerates on a north east sloping hillside at Tintilla means their mature shiraz vines enjoy an ideal growing environment. James says, "I love the subtleties of Hunter shiraz and with our Reserve Shiraz we are aiming for a flavour based wine, not dominated or inhibited by high alcohol, that will age well. The Hunter's famed staying power comes from wines with lower alcohol and some old Hunter's aged perfectly with alcohols around 12.5-13%. Today we pick at 13-13.5%, looking for slightly riper grapes with characteristic Hunter softness and berry fruit flavours." "The night harvested grapes were cold soaked to extract maximum fruit and phenolics, and then open fermented. New (about 30%) and old French and American oak barrels were used for malolactic fermentation and subsequent 12 months ageing before bottling. The result is a wine with all the Hunter characters you could ask for and a wine I could never get bored of, I drank it almost every day of Hunter Valley Wine & Food Month!" Tintilla also craft their shiraz fruit into two wonderful Fortified wines, the Tintilla Shortland Shiraz and the new Tintilla Old Parish Old Parish 15 Year Barrel Fermented Liqueur Shiraz, the former of which is named after naval officer John Shortland who discovered the Hunter Valley in 1797 and is an ancestor of the Lusby family. All three of these wines have signature Hunter Valley characteristics, and all are fantastic to drink now or to cellar away for that special occasion. Perhaps even a toast to next year's Hunter Valley Wine & Food Month – any excuse will do! thyme or a winter's rabbit stew. BOUTIQUE Clare Valley maker Julie Barry has come up with a stunner of a 2008 Shiraz under her quirkily-named Good Catholic Girl label, a wine that could possibly have had some Divine intervention as its fruit was picked in the midst of a fiery heatwave, yet remarkably it came through with flying colours. Julie's named this wine The James Brazill 2008 Clare Shiraz after her late father, Jim (James Brazill) Barry from whose superb Armagh vineyards he gave her cuttings in 1997 to start her own winemaking venture. With such a lineage those cuttings have certainly done her proud, for despite that fortnight of over 36-degree heat she was able to create a wine that's a veritable liquid Christmas cake of plum, blackberry and other dark fruit flavours, balanced by nice savoury notes. Good value at $30 to share on the table with lamb shanks baked in thyme or a hearty rabbit stew with winter vegetables; if you can't find it locally, email enquiry@goodcatholicgirl.com.au or phone Julie direct on 0419 822 909. FIRST-ever Grange, the experimental 1951 vintage. savour it with Wagyu beef. ONE FOR LUNCH: $51,062 just paid for a bottle of the first-ever Penfolds Grange – an experimental drop made by Max Schubert in 1951 – makes the $599 asking-price for the current-release 2006 look positively cheapskate. 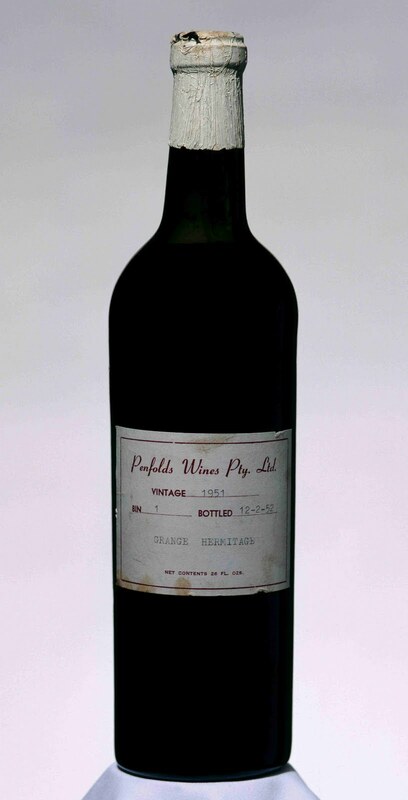 The 1951 Grange was amongst a number of rare Penfolds treasures auctioned online this month by Langtons; others included an Auldana St Henri, Magill 1911 (half-bottle) that sold for $1265 and a Penfolds Bin 379 Special Bottling Sauternes, Barossa Valley 1960 that fetched $1208. Langton's Founder and General Manager, Stewart Langton said the 1951 Grange was particularly interesting for collectors: "Grange has no parallel in the world," he said. "No-one can collect the first vintage of the great First Growth wines of Bordeaux, yet this is possible here in Australia with Grange." one a great match with seafoods. LILIAN Carter wasted no time in making her presence known as Stills Winemaker when she joined Victoria's Domaine Chandon at the beginning of 2010 after a six-year stint working in South Australia. Her 2010 Domaine Chandon Chardonnay that's just been released is a wonderfully sophisticated wine that she crafted by blending fruit from the higher reaches of the Yarra Valley, and which shows predominantly citrus flavours, with fruit from the Valley floor that's more stone-fruit dominated. The cool-climate Yarra Valley is renowned for its Chardonnays, and this one has good vibrant flavours from the careful use of fruit from those differing vineyards, coupled with secondary roasted spice and toasty characters from an almost-underplayed use of French oak. This is a wine you can certainly enjoy now with seafoods in particular – and Lilian suggests that a particularly nice match is with a creamy crayfish risotto – or put aside to age nicely in the cellar over the next five years. Pay $27.95. on the barbie with this one. ONE FOR LUNCH: AFTER a 2008 heatwave "vintage from hell" in the Harcourt Valley just south of Bendigo, 2009 proved far more benevolent – although vines that were still recovering from the previous year produced crops twenty-five per cent down on the norm. For BlackJack Vineyards' Ian McKenzie and Ken Pollock it was in fact something of a blessing with their reds in particular more concentrated in flavour and intensity than usual. Search out their 2009 Chortle's Edge Shiraz, which is absolutely loaded with ripe plum and dark berry flavours and nice tannins. Pay $18 and whip a Scotch fillet on the barbie. HOT, DRY, DROUGHT – PERFECT ! sweet and spicy beef short ribs. WHEN you get hot, dry drought conditions in the Hunter Valley, you can bet you are going to get low-yielding, wonderfully-flavoursome fruit from the Shiraz vines there at simply thrive under these harsh circumstances. And such was the 2007 vintage, giving Tintilla Estate's James Lusby just what he wanted for his iconic Tintilla Reserve Shiraz. "If you could not make a good wine in 2007," he jokes, "you shouldn't be in the winemaking game. "I love the subtleties of Hunter Shiraz," he says. "And with our Reserve Shiraz we aim for a flavour-based wine, not dominated or inhibited by high alcohol, a wine that will age well." And that's certainly what he achieved with the 2007: a wine with wonderful plum, blackberry and blackcurrant flavours, complemented with typical Shiraz black pepper and spice." At $30 this is a cracker drop to enjoy with such wintry fare as sweet and spicy beef short ribs and mash. ONE FOR LUNCH: AT its inaugural launch, the late Len Evans described Penfolds' Yattarna Chardonnay as "a step forward for Australian Chardonnay," referring to it being all about respecting the character of the individual sites from which its fruit originated. Happy 40th Birthday to the Canberra District Wine Region! It was back in 1971 that the first of now more than 35 commercial wineries was established near Canberra and the region has been growing from strength to strength ever since. Shaw Vineyard Estate is a relative new-comer having been established in 1998 but they have quickly become a hot topic in this cool climate thanks to a string of wine show awards and a premium vineyard that is, uniquely for the region, suitable for a wide range of grape varieties. The Estate's capacity to grow and craft 25,000 cases of wine means that winemaker/owner Graeme Shaw can create three core labels, each designed for a different occasion; Reserve, Premium and Winemakers Selection. Graeme explains, "As we have the ability to grow all our own grapes, including Riesling, Semillon, Shiraz, Cabernet and Merlot, it means we can quality-control every stage of production and be equally proud of all three of our labels. The Winemakers Selection range was created to provide affordable wines that are great value. It may be the cheapest at just $16 a bottle, but they are no less cared for." But you don't have to just take Graeme's word for it. Many others agree, with the Winemakers Selection range having been awarded 65 medals (19 of which are Internationals, including Golds from London, Vienna , New Zealand and Singapore) in just the last 2 years. "2008 was a hot year but the fruit flavours were magnificent so with some careful harvesting, avoiding all the bunches with shrivel, we obtained some wonderful shiraz, cabernet and merlot." "The Winemakers Selection Shiraz is delicately oaked so not to overpower the fruit flavours, which also have elegant spices on the palate typical of premium cool climate wines." "The Winemakers Selection Cabernet Merlot is similarly a wine with dominant fruit flavours and well balanced acid and tannins. In fact, the Cabernet was so good that 2008 was the first year we produced our Reserve Cabernet, the Merriman, a wine we will only create in the best vintages. Despite the spotlight often being shone on Canberra Shiraz, our estate ripens Cabernet beautifully and I think I'd be bold enough to say that the best fruit from our vineyard is Cabernet." Both wines are perfect for a celebratory Birthday BBQ! with veal cutlets and roast vegetables. BACK in the 1860s thousands of hopefuls rushed to New Zealand's Otago region as the cry of "Gold!" rang out across the South Island countryside – and today, 150 years on, there's a new "gold rush" going-on in the region. But this time it's for the wines from vineyards that many consider impossibly steep and rocky, and in particular Pinot Noir that's winning gold at shows and judging from vines that seem to revel in these toughest conditions. One maker, Essenze Wines has just released here its 2010 Regional Central Otago Pinot Noir from fruit that winemaker Corey Ryan chose from a scattering of vineyards to give diverse flavours from diverse ripening times. "Bendigo is the warmest region," he says, "giving rich, full-flavoured fruit, while Northburn Station's organically-run vineyards produce fruit with a touch of typical Central Otago thyme, and a half dozen others even further south give later-ripening fruit with differing but wonderful red-fruit and floral characters." It all makes for a great drop, particularly at $19.99, whose overall red cherry and plum characters make it a nice choice with veal cutlets and roast vegies. … or simply a beef stew. ONE FOR LUNCH: WITH winter now on us, a great combination for a family or friends' Sunday lunch is Logan Wines' Weemala 2009 Merlot, teamed with roast chicken and Mediterranean vegetables, or a simple hearty beef stew. This wine from Mudgee in the NSW Central Ranges, is one of those brooding reds to enjoy right now, or to put away in a cool dark spot for anything up to five years of so to brood to its heart content over its rich berry-fruit flavours that are paired with tobacco, violet, black olive and chocolate characters. At just $18 you'll realise why winemaker, Peter Logan says it's shaping as his favourite from 2009 for this year's cold-weather dining enjoyment.